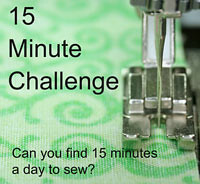 I haven't linked up to Kate's 15 minute challenge for a few weeks mainly because there hasn't been a lot of progress to report. I've been ignoring a couple of projects quite studiously which has been taking up a lot of time. I did make some progress this week and so you get to see the results. I go back to my normal 9 day fortnight this week for the first time in 6 months so Friday has been designated "sewing day". I spent some of the weekend making these blocks for someone I work with who is undergoing treatment for breast cancer. She has discovered she likes sewing mixed textile quilts together while she's having chemotherapy treatments so I was happy to oblige by making a couple of blocks. I've been in a bit of a sewing funk lately. I managed to de-funk this week and got all my Tis The Season Blocks finished and sewn together. I'm itching to start my next project but I'm on a promise to finish two already started quilt projects before I start the next one. Flurry finally saw the light of day again and got a teeny tiny amount of attention. I WILL finish the top by the end of this week! For more crafty reports pop on over to Life in Pieces. A sewing day Friday. Woohoo! Lovely block for your friend. And I love your Christmas quilt. Top almost done. That border is bringing it all together nicely. Good luck on your goal. Sometimes it's just hard not to start a new project! Love the selvage block ! Your a good girl finishing stuff off before you start a new project, im loving the look of the new project by the way, ive got hexies on the brain at the moment too! Your two quilt tops look fab, you will be all set for Christmas! Woo hoo for having every second Friday off again. That must feel so good. 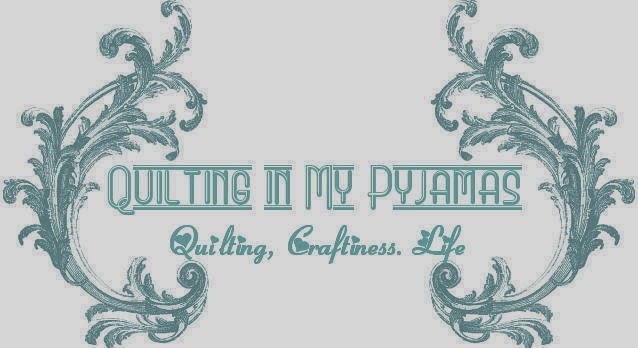 You've been busier than me, I just can't seem to get my quilting mojo happening at the moment. I'll do anything rather than sit down and sew, and that includes cleaning, call an ambulance now!!!!! Love the brights in your new block, can't wait to see the rest of them. Flurry is looking absolutely awesome, you only have a couple more borders to go and the tops all done. Flurry is looking good, I got stuck on the borders too, felt that quilt had a million of them. I like your "try it out block", very bright. Good luck with your goals next week. Welcom back to the challenge. The merry go round block is really great (and awfully bright too) -- what are you planning? Flurry is just wonderful! Tis the season is very very nice. and so are the blocks for your co-worker. what a great week. oh, and hooray on the return of the 9 day fortnight!! Your projects all look great! The Christmas boxes is one of my favorites. Wow! You are a whirling dervish. For someone who spends considerable time apologizing for her lack of production, you certainly are prolific. Love ALL of your work in this posting. The Christmas quilts warm my heart. Well done. Keep those fingers flying Shay! P.S. No need to reply via email. Conserve yourself! Great colours for Merry Go Round - hope those make it into the finished item. TTS is looking beautiful - not long now. I made a merry go round a few years ago! It was really fun to see the different blocks that came from two of the same fabrics. You will have fun. Just be as accurate as you can on your seam allowances... Too much and your seams make the center pop like a tent, too little and the little circles rip apart in the wash. But after I learned that, it was ally fun! I love that Flurry quilt top! So cheerful. I might need to join in on this challenge. Such a great idea. When you get out of a funk, you really go to it! Looks like you've got a lot of things moving along nicely. I love that merry-go-round. Looks like such fun. Your 'Tis the Season is looking festive, as is Flurry. Nice progress all around! Why is it always so much more fun to start something than to keep going on something? You have a lot going on, but it is all looking good. Hope you do better than me at staying focused! Love that pressie quilt! Ahh... there hasn't been a finish here for a while, but I have been having fun with lots of projects so it's all good! Oh. And starting things really is the best, but so is finishing things. I think the worst bit is stopping. If you could just start something and sew and sew and sew until it was finished I think that "high" would last the whole session. Darn eating, sleeping, work and family. They just all get in the way. Congrats on the Sewing Fridays. Lots of wonderful stitching going on over at your place by the looks of things. I'm so amused that one of your goals is to AVOID doing something, rather than to DO something. Good luck with that!